Soyabean, the main crop of Malwa region, has seen a sharp fall in prices. As a small-time commission agent who buys soyabean from farmers on behalf of oilseed crushing companies in Indore, Manilal Patel has a ringside view of what sparked the farmer unrest in western Madhya Pradesh this month. The fertile Malwa plateau here produces around 20% of India’s’s soyabean. As much as 80% of the crop used to be exported out of the country in the form of soyabean meal, which is the residue left after oil has been extracted from the beans. Over the last year and a half, however, there has been a glut in global soyabean production. In 2017, the estimated global production of soyabean will be 313.05 million tonnes, according to figures from the United States Department of Agriculture. There has been a 150% increase in global production in the last five to six years. Companies in United States, which used to import Indian soyabean as cattle feed, have turned to other countries which produce the oilseed at a lower cost. 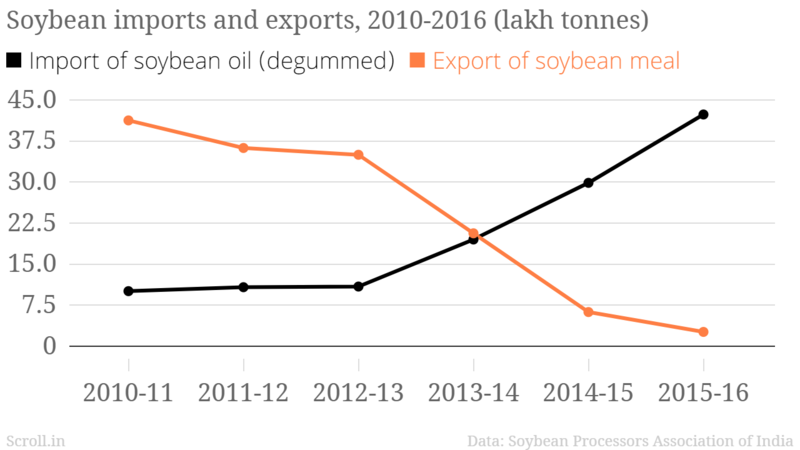 Simultaneously, India was flooded with cheap soyabean oil imports as global oil prices dropped low enough to make domestic production unviable for local players. 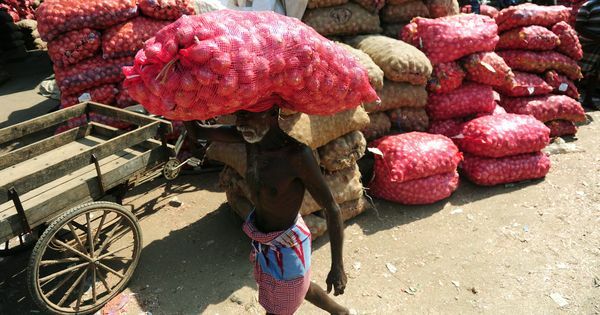 The maximum duty that the government can impose on the imports is 45%, but it chose to keep the rate at just 12.5%. Imports have shot up from 10.91 lakh tonnes in 2012-’13 to 42.35 lakh tonnes in 2015-’16. Unable to compete with the cheap imports, oilseed crushing companies have scaled back their production, said Patel, who lives in Sukliya Kshipra, a village in Indore district. The result is a precipitous fall in soyabean prices. In April and May 2015, Patel bought soyabean from local farmers for Rs 4,000 per quintal. By June and July, the price that companies were offering had dropped to Rs 3,200. Two years later, the rate has collapsed to as low as Rs 1,800 per quintal. 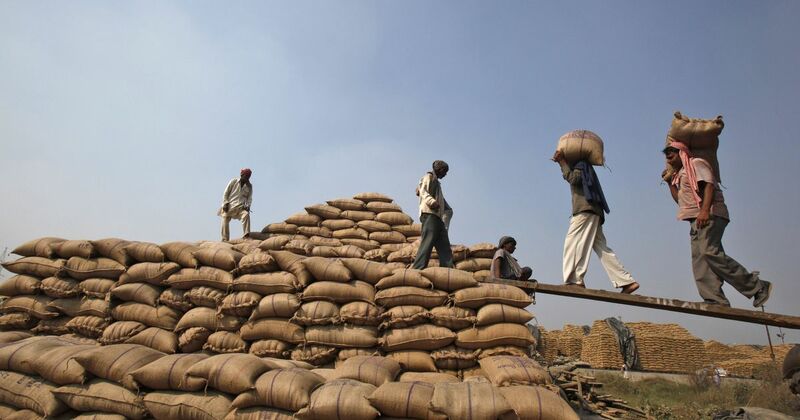 The average market price for soyabean in the region is Rs 2,773, which is Rs 2 less than the minimum support price of Rs 2,775 announced by the government. 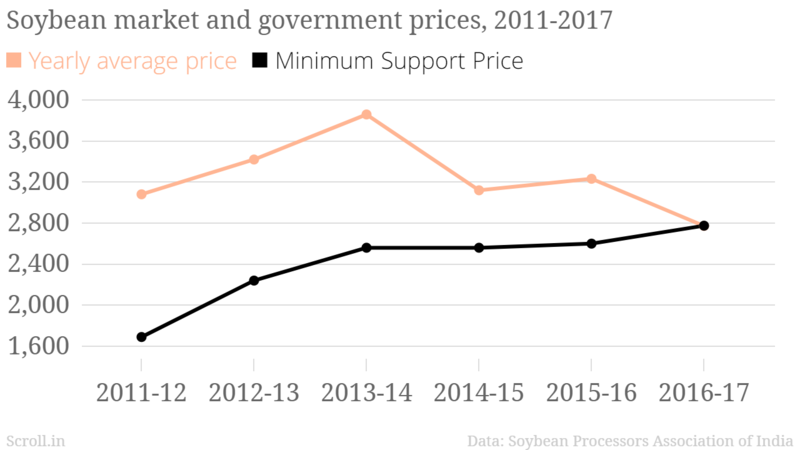 The minimum support price is the rate at which the government is supposed to buy from farmers – a safety net which does not work since the government rarely enters the market to make purchases. This is the first time in at least five years that the market price of soyabean in Madhya Pradesh is lower than the minimum support price. With government procurement limited, and with a continuous fall in market prices, several farmers still have 50% to 60% of last year’s harvest lying unsold in warehouses. In three months, the new harvest will come – soyabean, which is planted after the first rains, is a fast-growing crop. Now, the farmer will have no choice but to sell, Patel said. “This is the last rate they can hope for,” he added. How did soyabean enter the market? Soyabean began to be grown in Madhya Pradesh in the early 1980s on the back of heavy state support. The region’s black soil was considered ideal for the crop. “There was the larger, national context of intense shortage of edible oils which led to an aggressive search and promotion of alternative crops,” said PS Vijayshankar of Samaj Pragati Sahayog, a non-governmental organisation working in the area of water and livelihood security in the region. As the irrigation network expanded in the region, farmers began to grow wheat as a second crop in the rabi season, added Vijayshankar. This alternate cycle of soyabean and wheat remains the dominant cultivation pattern in the region. But it is now leading to depleting returns. Soyabean, soya meal and soya oil. 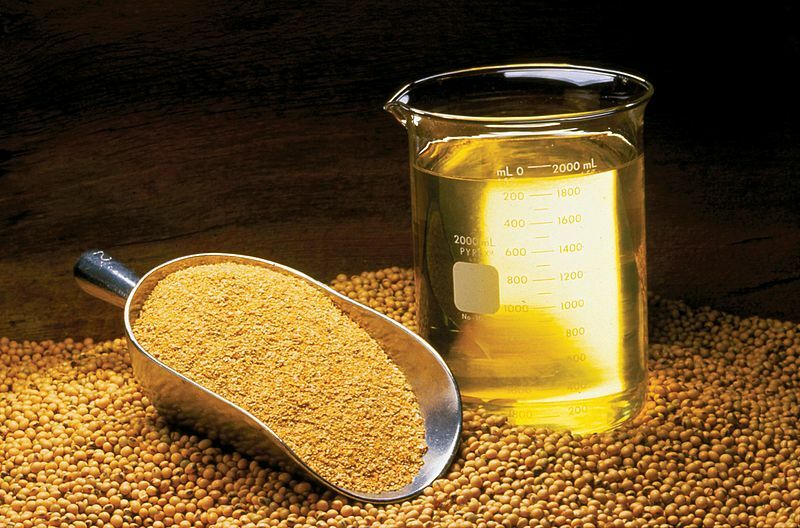 Photo credit: By United Soybean Board (Soybean Oil, Meal and Beans) Licensed under CC by 2.0/Wikimedia Commons. The decreased productivity has made India less competitive in the global market. Part of the reason for low productivity, he said, is that research into new seeds simply does not reach the market. The most popular soyabean seed currently used by farmers was developed 23 years ago. A report in the Free Press Journal in 2012 noted that the processing plants of the semi-government organisation, worth crores of rupees, were lying defunct. In 2016, the state government decided to merge OILFED with the agriculture development department, making in effect, a transfer of 41 employees. Better prices for their crops is what farmers in Madhya Pradesh want the most (not loan waivers).